Wash boneless chicken breasts & cut into sufficiently thick strips. Marinate it with ginger garlic paste & 1/3 tsp. salt. To prepare onion flakes, peel & quarter the onion & then gently peel off flakes. Deseed & separate the membrane of the capsicum & dice it into thick pieces. In a cup mix corn flour with water to make a slightly thin paste. In a non-stick wok heat oil till hot. 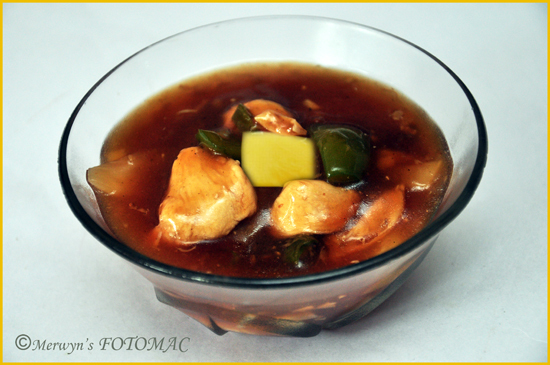 Reduce heat & saute the marinated chicken pieces till cooked but tender & transfer to a bowl. In the same wok, if required add a little oil & saute chopped garlic, grated ginger & minced green chillies. Add onion flakes,capsicum & stir fry for 2 mins. Then add the fried chicken strips & toss well. Pour in the stock/water, soya sauce & stir. Let the gravy come to a boil; stir the gravy while pouring in the cornflour mix till the gravy thickens. Make sure it is not lumpy. Stir in the pineapple pieces, sugar & mix well. The gravy should be sufficiently thick & of pouring consistency. Taste the gravy & adjust salt to taste. Note : The feedback , comments & suggestions column has been upgraded & made more user friendly especially for my followers from facebook. So please go ahead & share your valuable thoughts with me.